The Vail Homeowners Association has been successful in getting the Vail Town Council to begin to address the community’s transportation and parking issues. A task force has been established to study and propose solutions; the specifics as to areas of research, budget, time table and reporting have not yet been made public. 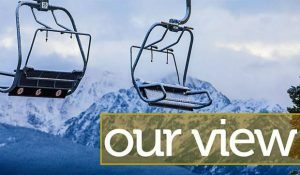 If managed correctly, then this could be a real opportunity to develop a comprehensive plan and policies to address Vail’s present and future transportation and parking needs. Whether that happens remains to be seen, as the tilt of the representation on the task force will be commercial, even though the full spectrum of transportation and parking issues go well beyond those of business interests. Real and lasting solutions should not only serve business needs but, also, improve public safety and benefit the entire community. It has long been assumed that Vail needs more parking facilities. As a starting point, the new task force should undertake an assessment of Vail’s present and future parking needs. That would necessarily involve a realistic examination of the carrying capacity of the town. During the first half century of the town’s existence, Vail was growing, so there was little need to be concerned about ultimate capacities or plans for when the town reached full build-out. That is no longer the case. There is virtually no vacant land left, and while some growth will take place, future development will involve replacement or restoration of existing structures. Likewise, there is reason to believe that the mountain has reached full capacity, at least as far as peak capacities are concerned. So, from a planning standpoint, the town should be addressing foreseeable needs in that context; i.e., how much more parking does Vail need at full capacity? Predictable parking needs should drive Vail’s parking policies. There is wide consensus that, at present, Vail needs somewhere between 500 and 600 parking spaces. Whether that is correct should be determined in connection with a realistic assessment of the town’s total capacity and needs. That should include not only winter and summer visitor needs but also workforce parking. Worker housing is now largely outside of town, requiring a transportation system and parking to enable those workers to reach their daily employment. Vail has embarked on a 10-year affordable housing plan that could expand parking needs, but it is already on shaky ground. It requires more than $30 million in additional taxes, and recent public meetings have revealed a strong negative attitude toward more taxes for affordable housing. Whatever the outcome of that assessment, it will set the basic planning parameters for parking needs. Only then can realistic solutions be explored. Another important determination that should be made is exactly how many parking spaces presently exist; i.e., are available through the town’s structures and private facilities. It is generally believed that in the Vail Town Center, there are about 4,600 public and private parking spaces. Of those, 2,400 are controlled by the town of Vail and 2,200 by the private sector. There are roughly 600 to 1,000 additional spaces on the frontage roads. Much of the existing private parking is underutilized, but factual data remains to be gathered. The more private spaces available for public parking, the less the demand for additional structures and unsafe frontage road parking. In recent years, there has been tension between Vail’s need for parking revenue and the utilization of private parking that has operated to prevent full utilization of the private facilities. Future policies should eliminate any such constraints.